Almost 20 years later, the Illinois Central College back-to-back women’s basketball national championship teams have earned a spot in the Greater Peoria Sports Hall of Fame. 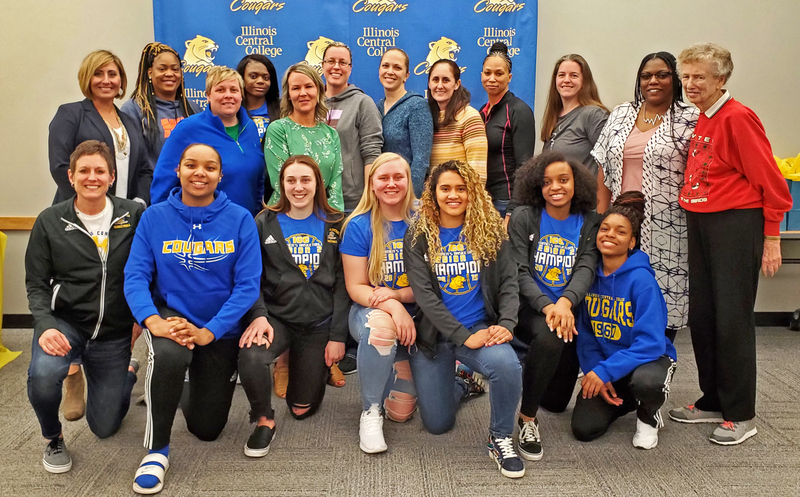 The 1997-98 and 1998-99 women’s teams were inducted Saturday night with former coach Lorene Ramsey (GPSHOF class of 1982) speaking on behalf of the teams. The ’97-98 Cougars (30-5) overtook Penn Valley Community College, 72-65, in the NCAA national title game. ICC wasn’t done with just one national championship and made another run through the tournament to claim its second consecutive title. The ’98-99 team (31-2) defeated Northwest-Shoals Community College, 86-81, to be crowned again. Both years, coach Ramsey was named the NJCAA Div. II Coach of the Year. Former ICC baseball assistant coach and longtime area baseball proponent, the late Mike McDonald, was also inducted into the GPS Hall of Fame. McDonald’s wife, Peggy, accepted the award and honors Saturday night.